You never know when the worst may happen and you lose your pet. 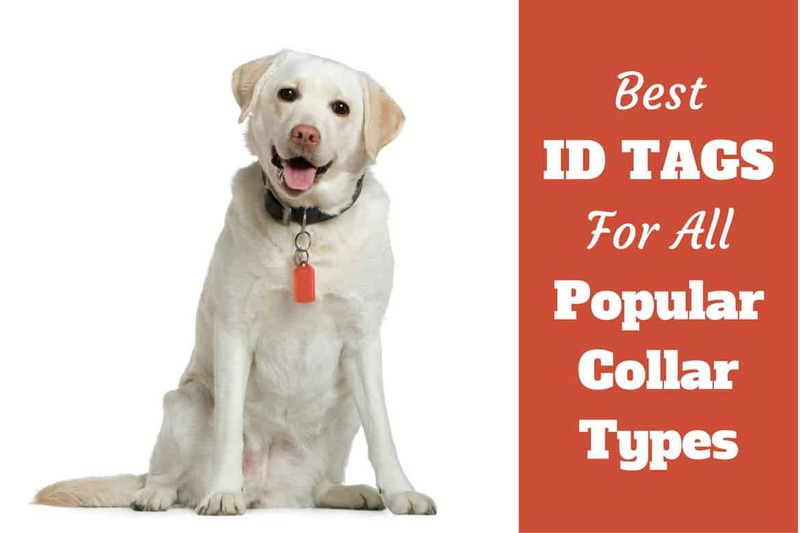 An ID tag with your contact information is by far the quickest and most stress free chance for you and your dog to be re-united as quickly possible. Not only this, but for many places in the world ID tags are actually compulsory by law! But it doesn’t mean you have to compromise on your canine friends good looks! There are lots of stylish options available, in different shapes, colors and materials, and we’ve hand-picked a few of our favorites for you to see below. 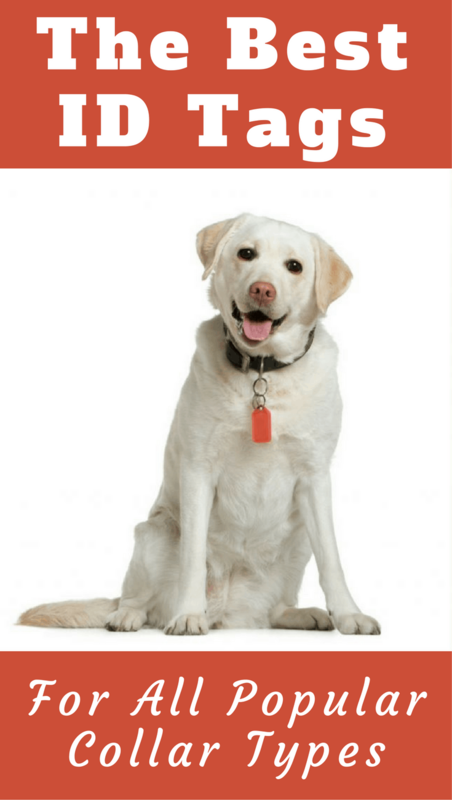 Read on to explore some of what are, in our opinion, the best dog id tags available on the market. Your address, including ZIP or postal area code. Although not essential, it’s a very good idea to include your phone number. The vast majority of people will helpfully call a number they find on the ID tag of a lost and found dog and this is the quickest way for you to be re-united. Should You Include Your Pets Name on the Tag? 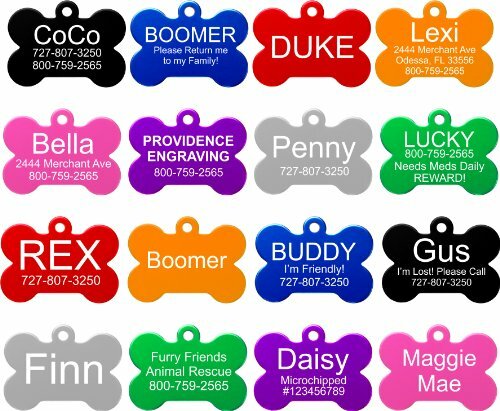 If you include your dogs name on the tag: Some say your dog will feel more comfortable around the stranger that finds them if they use your dog’s name, are then more likely to hang around and wait for your re-union and so their name should be on the tag. Also, if your dog is found and restrained yet manages to slip their collar, it’s said there’s a higher chance they can still be controlled and kept by the finder if they can calm your dog by calling their name. If you leave your dogs name off the tag: In a dispute over ownership, you’re more likely to have your pet returned if you can prove you know their name and the other person does not! It’s also said that not having your dogs name on their tag makes it both harder for a thief to steal them, and also for the thief to sell your dog on. This is because your dog will feel less comfortable going with a person who doesn’t even know their name and prospective buyers find it odd the seller doesn’t know it or the dog doesn’t react to the made up name when called. This red flag sometimes alerts people to the fact the dog may be stolen. I can see sense in both sides of the argument…so essentially the choice is yours! These are the traditional style ID tags familiar to everyone. Available in circle, bone, star and many other shapes, in polished brass or mirrored stainless steel, as well as a whole multitude of colors, there’s bound to be something to suit your taste. Anodized aluminum for higher durability and longer lasting tag when compared to bare aluminum alone. 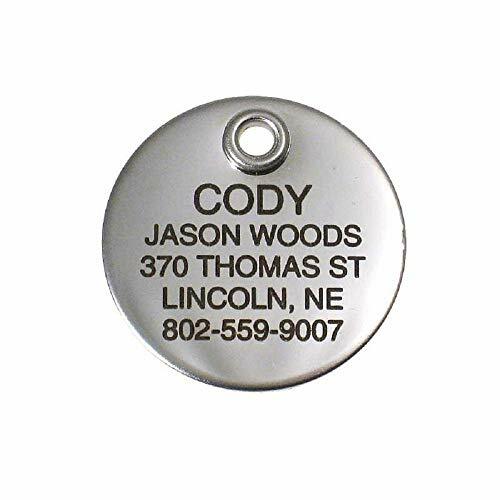 8 shapes and 8 colors to choose from, making 64 total variations and custom engraved with up to 4 lines of text with 18 characters per line for your dogs essential information, it’s little wonder this pet ID tag is the most popular Amazon. This lightweight aluminum, anodized for higher durability and available in 9 different colors so you can easily find the right color to complement your pooch and their chosen collar. 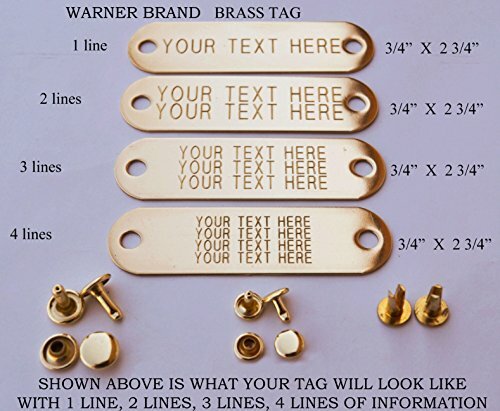 Custom engraving of up to 4 lines of 16 characters per line on both sides of the tag, you can include whatever information you deem fit by entering the details at checkout. 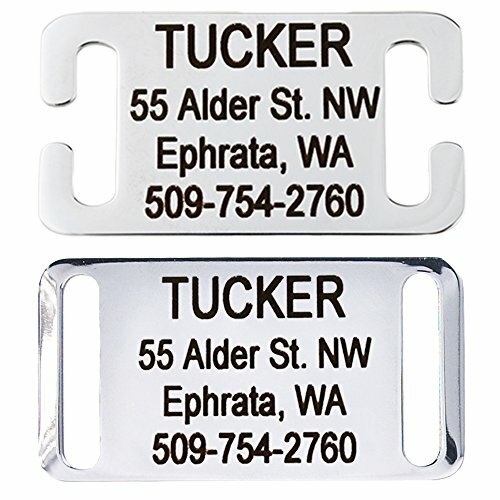 Premium ID tags made from stainless steel that is far stronger than aluminum, lasting longer and far less likely to wear thin and break. Round, bone or heart shapes available with up to 4 lines of text on each side of up to 22 characters per line. More than enough for all the essential information needed. These tags look stylish, are long-lasting and in my personal opinion look a little more classy than the usual brightly colored varieties. 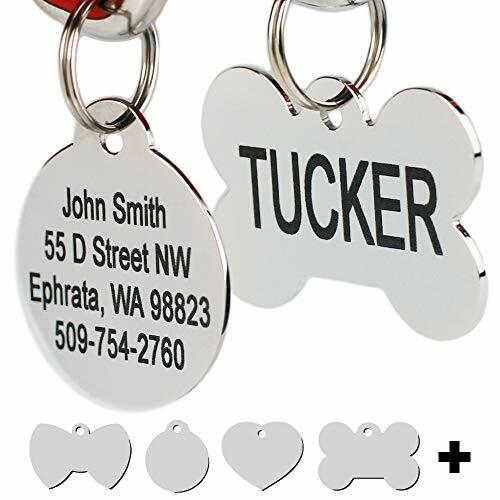 A classic looking, 1 inch diameter round, stainless steel or brass metal pet ID tag. Available in highly polished mirror finish, or matte (dulled look) finish, in stainless steel or brass. Up to 5 lines of custom engraving engraving for all your pets essential information. Highly polished nickel plated metal dog tags with hard, clear epoxy resin coating on the glittered paw print design face. 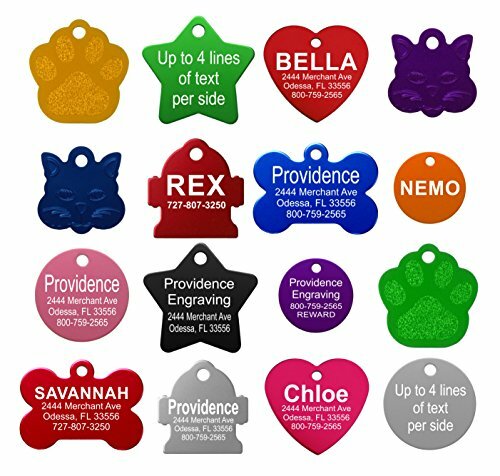 13 colors available, complete with split ring for attachment and up to 3 lines of 13 characters of text for your pets info. 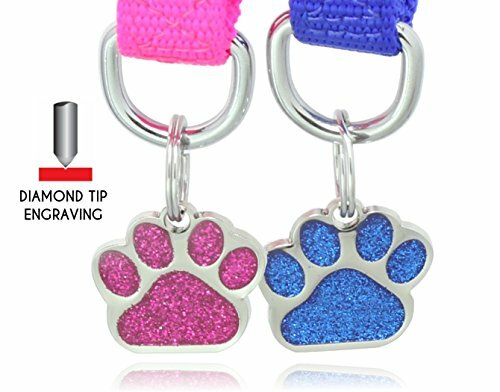 These tags add a bit of sparkle and personality to your dogs looks and can look quite fetching when paired with a similarly snazzy collar. Slide on tags are only suitable for buckle collars as they WILL NOT fit over plastic snap fastenings. So please, don’t consider a slide on tag unless you know it will fit! The rivet-on tags are suitable for any collar and offer an alternative – and some say more stylish – look instead of the traditional hanging tags seen in the previous section. For high quality, stylish leather collars, these are some of the best dog ID tags to complement the look by avoiding having items hanging and swinging from your dogs neck. Beautiful slide-on ID tags made from durable, long-lasting stainless steel. Up to 4 lines of text with 18 characters per line personalized engraving. Slides onto single thickness collars with metal buckles…WILL NOT slide onto collars with plastic snap fastening. An ID tag that rivets directly onto a collar, made from stainless steel or polished brass. For some people, riveting the tag directly onto the collar results in a neater looking tag compared to the traditional tags that hang loose. A good alternative for people that wanted a slide on tag but can’t due to the size of the fastening. 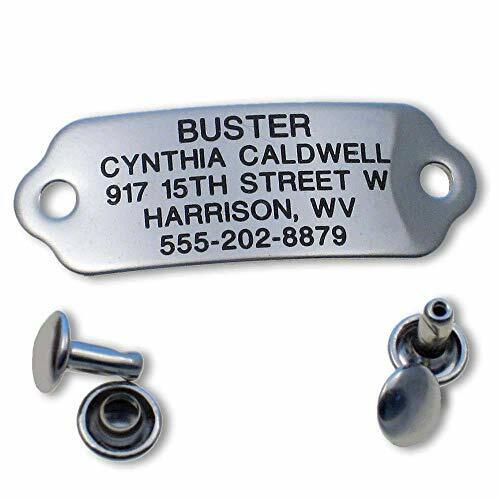 Brass, rivet-on ID tag, customizable with up to 4 lines of 22 characters text engraved of your pets essential information with 3 sets of rivets included. Collar must be at least 3/4″ wide. The best ID Tags on Amazon, filtered for the highest rating and popularity. Please be aware this page contains affiliate links and Labrador Training HQ receives a small commission if you make a purchase through such links. This has no effect on the final price you pay and we are very grateful for your support.